Be it at the club, at home or at a fabulous retreat – it’s no doubt that each and every one of you made it as special as it can be. Celebrating with your loved ones close by your side, while you count down the seconds for the New Year is the ultimate New Year resolution. So you can check that one off your list. And while most of us think celebrities would spend NYE in no other way than by spending big cash and extravagant parties (while most of them do) it wasn’t the case with some of our favourite celebrities this year. Topping the list is our favourite footballer because he spent NYE with his family in a country most of all know and love; Dubai. Just like millions or residents in the UAE, the Portuguese football posed for a snap in front of the 7-star hotel, Burj Al Arab, with his Spanish model fiancée and child. The three seemed to have enjoyed the gorgeous backdrop of Dubai’s iconic views and NYE fireworks. A lady that we’ve been following for a while, spent her NYE with new hubby, Nick Jonas in the Swiss Alps. 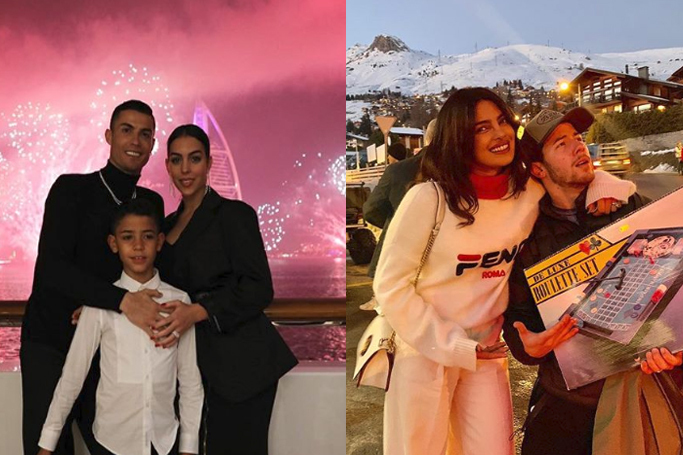 With no shyness on the ‘gram, Priyanka takes every opportunity to snap the life of newlyweds on vacation. Alongside Nick’s family and brother Joe Jonas with his fiancée Sophie Turner – the four had the perfect double date getaway this festive season. We wouldn’t miss a chance to dish on the woman who almost broke the internet, Kim Kardashian. Miss West seemed to have one of the most extravagant NYE dinner at her gorgeous mansion in Aspen, Colorado with her close celebrity friends posing for memorable pictures – including old bestie, Paris Hilton. While most A-list stars took a day off to celebrate the New Year with their friends and family – Lady Gaga took to the stage instead. Performing at a special show on New Year’s Eve in Las Vegas, Lady Gaga was also welcomed on stage with Celine Dion and Gwen Stefani for a memorable NYE concert. This is probably why we love Drew Barrymore – not only is she a hilarious comedian and actress, she made sure not to leave her sense of humour behind in 2018. Posting a quirky video on her Instagram, the American actress spent her NYE in a nontraditional way. Pencilling in a last minute dance cardio workout, Barrymore danced her way into 2019 and we cannot be more in love with her #newyearattitude.